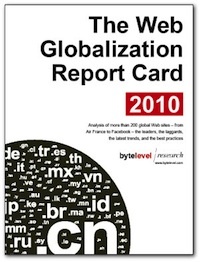 I’m pleased to announce the publication of the 2010 Web Globalization Report Card. Google has emerged on top again, but just barely. The big story this year is that Facebook and Google finished in a numerical tie. But because Google supports more languages (for now), it edged out as the winner. Moving down the list, there are a number of familiar faces — companies like Cisco and Philips, Panasonic, and NIVEA. But there are some new faces as well. Samsung jumped up in the rankings due to improvements to global navigation and localization. Kodak, Symantec, and Autodesk are also new to the top 25. Although these sites represent a wide range of industries, they all share a high degree of global consistency and impressive support for languages. They average 50 languages — which is more than twice the average for all 225 sites reviewed. Even as we look across all 225 web sites, the number of languages continues to increase. Although the rate of language growth slowed over the past two years — due in large part to the global recession — growth continues. This year, the average number of languages increased to 22, up from 20 languages in 2008. It wasn’t that long ago that any web site that supported 10 languages would have qualified as “global.” The new baseline is 20 or more languages, and climbing. I will be posting additional findings in the days and weeks ahead. If you want to learn more, we’ve posted a brochure here. What if your company didn’t make the top 25 list?